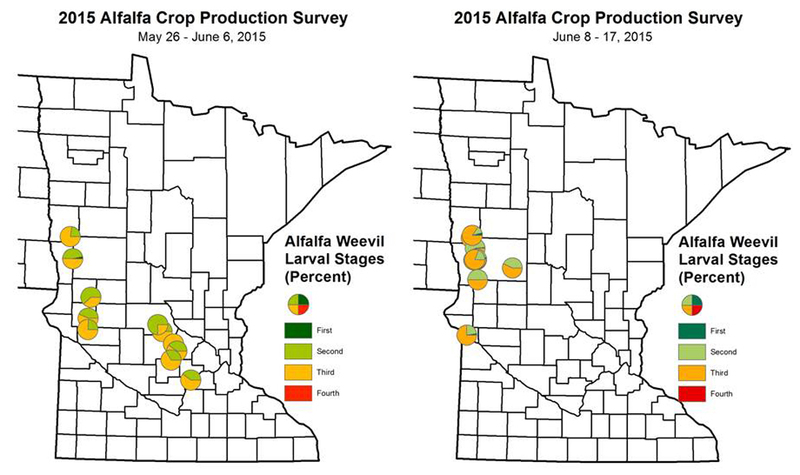 Alfalfa fields in west central (WC) and northwest (NW) Minnesota have been sampled for alfalfa weevil over the past 3 weeks. Though the spring started off warm and we anticipated early development of weevil populations, the cool wet conditions slowed development in the region. Currently, weevil populations are predominantly in the 2nd and 3rd larval stages in these areas (see maps). Very few 1st stage larvae are present (< 3% of the population). Larvae should be moving to the the 4th stage in these regions soon. The majority of the alfalfa has been cut, OR, there are some fields in the NW that are still waiting for a break in the weather to be cut for the first time. Keep in mind that the greatest feeding damage is inflicted by 3rd and 4th stage larvae. Up until now, the scouts have reported only minor, visible feeding injury seen as shot-holing on leaves. Scout stubble fields within 4-5 days of cutting. When scouting early second crop, pay close attention to fields with 1st cutting damage and higher alfalfa weevil populations. Inspect underneath windrows for surviving larvae concentrated in the swath. Second cutting thresholds vary by state but weevil damage to second crop can result in yield loss through delayed re-growth. 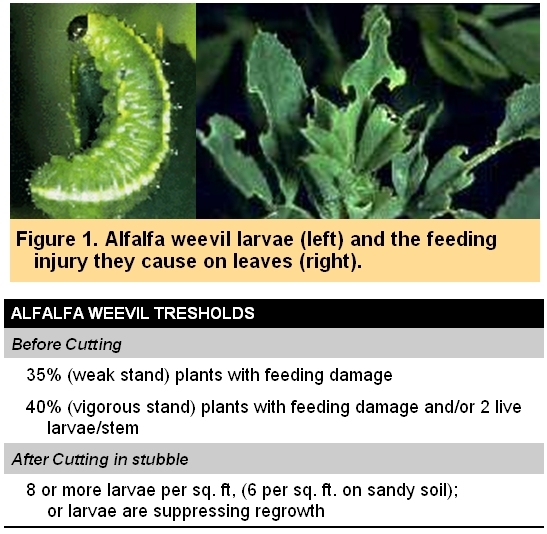 Determine if alfalfa weevil larvae are numerous (8 or more adult and larvae/square foot), if 50% of the crowns show weevil feeding, or is the presence of weevils and their feeding the reason re-growth is delayed? If so, an insecticide application is recommended.